Bill Wilson Center receives many local, regional and national awards recognizing our success helping homeless youth transition their lives off of the streets. Included is sampling of some of the honors that Bill Wilson Center has received for our work. The White House honored Sparky Harlan as a Champion for Change in 2012 for making a significant difference in the way communities combat homelessness among children and youth. 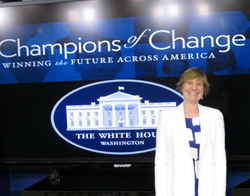 The Champions of Change program was created as a part of President Obama’s Winning the Future initiative.